A single plate, dry disc clutch is used in cars equipped with synchromesh transmissions. 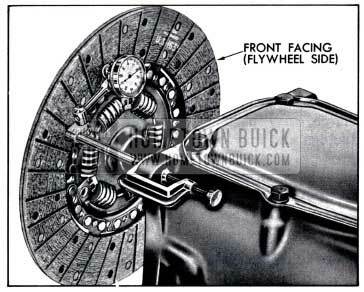 The 1958 Buick clutch is of conventional design with coil type clutch springs and three release levers. The release levers are non-adjustable. The 1958 Buick clutch pressure plate and cover assembly will be serviced only as a complete unit. 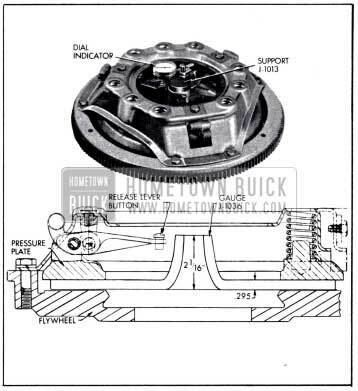 The 1958 Buick clutch cover is bolted to the flywheel and three lugs on the pressure plate engage slots in the cover to transmit torque to the plate. Nine clutch springs are located between the cover and the pressure plate. The three clutch release levers are located so that their inner ends are in position to be engaged by the 1958 Buick clutch release bearing. The levers pivot on fulcrums bolted to the 1958 Buick clutch cover and on bearings in the three pressure plate lugs. See figure 4-1. The outer ends of the release levers are weighted so that at higher engine speeds where slipping is liable to occur, centrifugal force causes more pressure to be applied on the pressure plate. 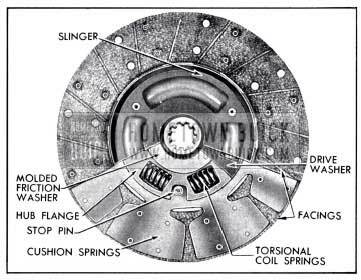 The faster the clutch revolves, the greater the pressure exerted against the1958 Buick clutch plate, thereby increasing the torque transmitting ability of the clutch. This additional pressure allows the use of a clutch which requires lower foot pressure at the pedal for normal clutch operation. 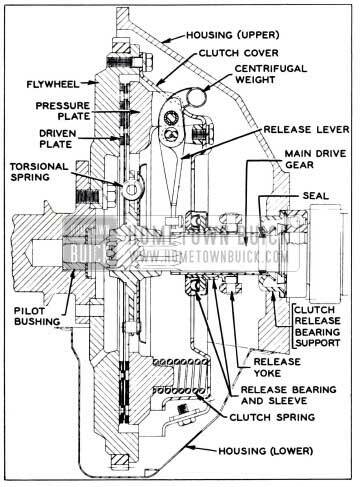 When the 1958 Buick clutch is in the engaged position, the release levers are clear of the release bearing and the clutch springs cause the pressure plate to clamp the driven plate against the flywheel with sufficient force to transmit power of the engine without slippage. The power drive is from flywheel to clutch cover, cover to pressure plate, and from pressure plate and flywheel to driven plate. 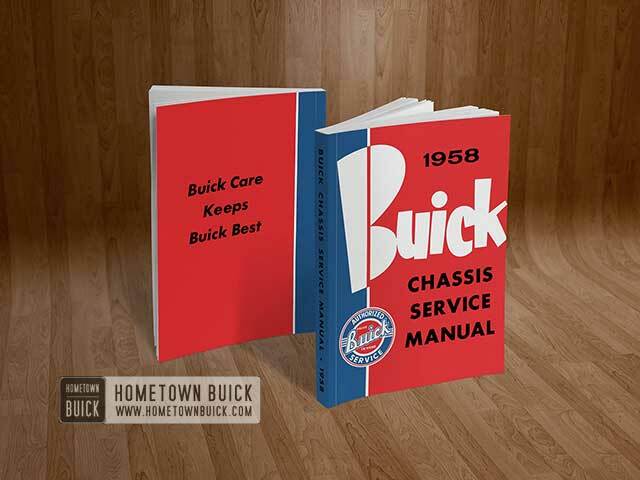 When the 1958 Buick clutch is disengaged, the clutch release bearing presses forward on the inner ends of the release levers which pivot and force the pressure plate rearward against the pressure of clutch springs. The pressure plate is moved rearward far enough to free the driven plate. See figure 4-1. The 1958 Buick clutch driven plate assembly is mounted with a free sliding fit on the transmission main drive gear and is keyed to the gear by ten splines. The front end of the main drive gear is piloted by a ball bearing pressed into a recess on rear end of engine crankshaft. See figure 4-1. The outer area of the driven plate is divided into segments which are formed in low waves to provide springs between the plate facings and thereby cushion engagement of the 1958 Buick clutch. A woven facing, grooved to give quick release, is riveted to each side of every segment of plate. When the 1958 Buick clutch is fully released, the waved segments cause the facings to spread approximately .050″ and the movement of pressure plate provides an additional clearance of approximately .030″ to assure full release of driven plate. See figure 4-2. The driven plate assembly is designed to prevent torsional periods of the engine from being transmitted to the transmission gears and causing rattle. This is accomplished by driving the plate hub through torsional coil springs and providing frictional dampening by means of molded friction washers. The 1958 Buick clutch pedal is of the suspended type and is mounted between hinge brackets bolted to the cowl. Pedal position at rest is determined by a rubber pedal bumper mounted on a non-adjustable bumper support. The portion of the pedal beyond the pivot projects through the cowl where a cable quadrant is bolted to it. As the pedal is depressed, the cable quadrant and cable are raised, causing release equalizer to turn. See figure 4-3. This rotation of the equalizer pulls the 1958 Buick clutch release rod to the rear which in turn pulls the clutch yoke rearward to disengage the 1958 Buick clutch. The pedal pivots on nylon bearings which do not require periodic lubrication. The cable runs over a pulley and is fastened to the equalizer. The pulley is adjustable so it can be aligned with the cable. The cable length is adjustable so that the equalizer can be properly positioned (par. 4-4). The correct equalizer position is such that the equalizer over center spring helps to hold the pedal firmly against the pedal bumper when the pedal is released. However, after the pedal is slightly depressed, the over center spring helps to reduce pedal pressure. This spring is attached to the equalizer bracket by an eye bolt, and to a pin on the equalizer by an extension which straddles the pivot point of the equalizer. See figure 4-4. The equalizer has a fitting which should be lubricated periodically (par. 1-1). The release rod, which extends from the equalizer to the 1958 Buick clutch yoke, has an adjustable end. The yoke is held on a ball stud by a U-shaped spring riveted to the yoke. A boot around the yoke provides a flexible closure for the yoke opening in the flywheel housing. The inner end of the yoke is in position to push forward on the release bearing when the clutch pedal is depressed. A U-shaped spring riveted to the release bearing holds the bearing in contact with the yoke. The release rod length must be adjusted to provide correct clearance between the release bearing and the 1958 Buick clutch release levers (par. 4-4). A return spring is connected between the release rod clevis pin and a bracket on the engine to keep the release bearing out of contact with the release levers when the 1958 Buick clutch is not in use. The release bearing and sleeve assembly is mounted on a bearing support which encircles the transmission main drive gear. The bearing is filled with lifetime lubricant in production and no further lubrication is required. The bearing support is flared at the rear end to seat in the flywheel housing and is held in place by a spring washer and the outer race of the transmission main drive gear bearing. See Figure 4-1. The pressure required to depress 1958 Buick clutch pedal to toe board should not exceed 28 pounds. If pedal pressure is excessive, make certain that pedal is not binding in floor mat or toeboard. Thoroughly lubricate release equalizer with chassis lubricant. If excessive pedal pressure still exists after release linkage is properly lubricated, lubricate internal working parts of 1958 Buick clutch as described in paragraph 4-4. Squeaking and grinding noises during 1958 Buick clutch pedal operation are usually caused by heavy friction in the release linkage or internal parts of 1958 Buick clutch assembly. Before condemning the release bearing, thoroughly lubricate release equalizer and, if necessary, lubricate internal working parts of clutch as described in paragraph 4-4. A very slight amount of oil on driven plate facings will cause clutch grab and chatter. A new driven plate must be installed if original plate facings contain oil since removal of oil from facings is not practical. When oil is found on facings, examine pilot bushing, transmission drainback, rear engine bearing, and oil leaks which might drain back into 1958 Buick clutch housing between upper and lower flywheel housings. Improper variation in height of release levers will cause clutch chatter. See paragraph 4-5 (b). 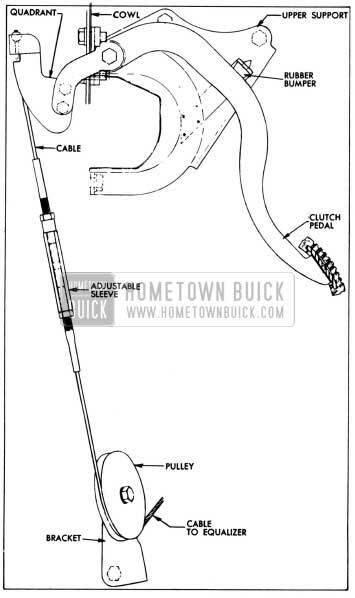 To correct this condition, the complete 1958 Buick clutch assembly must be replaced, because the release levers are neither adjustable nor available for replacement. To test for clutch drag or failure to release, depress 1958 Buick clutch pedal to toeboard with engine running and shift transmission into low gear. Hold pedal depressed and shift transmission to neutral, wait about 15 seconds with pedal depressed and again shift into low gear. If 1958 Buick clutch is not releasing completely a gear clash will occur. If test shows that 1958 Buick clutch is not releasing properly, check clutch pedal lash (par. 4-4) and check release linkage for lost motion. Correct as necessary and again test for clutch drag. If 1958 Buick clutch drag cannot be corrected in release linkage, remove 1958 Buick clutch and check height of release levers. Check driven plate for oil soaked or cracked facings, also for run-out and free movement on main drive gear (par. 4-6). First make certain that 1958 Buick clutch pedal is adjusted for specified lash (1 1/8″ to 1 1/4″) and that pedal is not binding. One type of clutch slippage is sometimes wrongly diagnosed as due to weak clutch springs. This slippage occurs during gear shifting and full engagement of the 1958 Buick clutch is not obtainable until the engine speed is reduced. After full engagement is obtained no further slippage occurs during acceleration or under full load. This condition is usually due to the clutch driven plate hub sticking on the splines of the transmission main drive gear. Correction can be made by removing the 1958 Buick clutch and thoroughly cleaning splines of driven plate and main drive gear then applying a light coating of Lubriplate. Make sure that release lever pins are not binding, and that pressure plate driving lugs are not binding in clutch cover. It is very important to maintain proper pedal lash (free pedal) at all times. Insufficient pedal lash will cause the release bearing to ride against the release levers resulting in abnormal wear of these parts; it may also cause clutch slippage and abnormal wear of the driven plate, flywheel, and pressure plate if pressure on the release levers is enough to prevent positive engagement of the 1958 Buick clutch. Make certain that return spring pulls 1958 Buick clutch pedal firmly against pedal bumper when pedal is released. If pedal does not contact bumper, check pedal and linkage for binding or lack of lubrication. Check condition of release yoke return spring. Check condition of equalizer over-center spring and make sure that spring eye bolt is fully tightened. See figure 4-4. The first step in making a clutch linkage adjustment is to check position of clutch equalizer. If equalizer is properly positioned, gauging hole in equalizer will be lined up with two holes in equalizer bracket so that a 1/4″ x 2 1/2″ bolt or pin will slip freely into holes. If equalizer position is OK, proceed to step 8 below; if not, change cable length until equalizer is properly positioned as described in steps 3 through 7. Before changing cable length, first check cable pulley for alignment with both upper and lower portions of cable. If pulley is not aligned, loosen mounting bolts slightly and align. Tighten bolts securely. See figure 4-3. To shorten cable, first clamp locking pliers on both upper and lower cables just off threaded sections to keep cables from twisting. Loosen cable adjusting sleeve jam nuts. Turn adjusting sleeve clockwise as viewed from top to shorten cable. Cable length is correct when gauging pin slips freely into holes in equalizer and equalizer bracket. Tighten adjusting sleeve jam nuts. Remove locking pliers. Remove release rod adjusting end cotter key and flat washer. Remove return spring. Remove release rod to yoke clevis pin and spring washer. Loosen release rod adjusting end jam nut and adjust end until clevis pin fits freely with yoke held to rear. Then lengthen release rod by rotating adjusting end 4 turns. This will provide proper clearance between 1958 Buick clutch release bearing and release levers. Replace clevis pin and spring washer. Hook return spring over clevis pin. Install flat washer and cotter key. Tighten release rod jam nut. Check pedal lash (free pedal) by pushing on pedal pad with hand. Do not mistake tension of pedal return spring as an indication of lack of pedal lash. Pedal lash should be 1 1/8″ to 1 1/4”, measured at pedal pad. Disconnect release rod from yoke, unhook boot from opening in flywheel upper housing, and pull yoke outward to disengage it from ball stud. See figure 4-5. Apply Lubriplate or Delco Brake Lubricant to ball stud and ball seat in yoke, then connect yoke to ball stud. Hook boot to opening in flywheel housing and connect release rod to yoke. Examine 1958 Buick clutch release bearing and sleeve assembly to see whether it is binding on release bearing support due to improper installation. Lubricate any contact point between bearing sleeve and support by brushing with Lubriplate or Delco Brake Lubricant. Brush lubricant on pressure plate driving lugs where they contact cover. Work clutch pedal a number of times to work lubricant into contact points. Rotate flywheel until each release lever in turn is in lowest position, then very sparingly oil the release lever fulcrums and sides of release levers. Allow time for any surplus oil to drain off before turning flywheel, to avoid getting oil on driven plate facings. Release lever fulcrums also may be lubricated by spraying with powdered graphite, which will not damage driven plate facings. This may not afford immediate relief but if 1958 Buick clutch is operated while engine is running, after installation of flywheel lower housing, the graphite will work into the bearing surfaces. Remove rear axle assembly (par. 6-4) and transmission (par. 4-13) – Remove flywheel lower housing. Disconnect release rod from release yoke and remove yoke boot. See figure 4-5. Remove spring washer which retains release bearing support in flywheel housing and remove support and gasket. Pull outward on release yoke to free it from the ball stud in flywheel housing and remove yoke and release bearing through bottom of housing. Separate yoke from bearing. Mark the 1958 Buick clutch cover and the flywheel with a center punch so that cover can be reinstalled in the same position on flywheel in order to preserve engine balance. Loosen each clutch cover bolt a little at a time in order to relieve 1958 Buick clutch spring pressure evenly and avoid distortion of cover. Metal spacers placed between release levers and inner edge of clutch cover will aid removal and later reinstallation by holding clutch springs compressed. Support pressure plate and cover assembly while removing the last bolts, then remove the cover assembly and driven plate. Mount dial indicator on Support J-1013, set support on flat surface, press indicator stem down against surface until indicator hand has made one revolution, then tighten indicator to support and set indicator to zero. See figure 4-6. Place Adjusting Gauge J-1036 on spare flywheel and place 1958 Buick clutch assembly on gauge so that release levers are directly above machined bosses of gauge. NOTE: Thickness of gauge at machined bosses is .295″; height of gauge at hub is 2 1/16″. Install cover bolts and tighten each one a few turns at a time until all are uniformly tight. Carefully place support and indicator on machined hub of gauge so that indicator bears on inner end of release levers. Indicator should read within plus or minus .031″. Also, all three levers should read within .031″ of each other. If release lever heights are not within specifications, or any part of the 1958 Buick clutch assembly is defective, the whole clutch pressure plate and cover assembly must be replaced as a unit. Very sparingly apply front wheel bearing lubricant to main drive gear pilot bushing in. crankshaft. If too much lubricant is used it will run out on face of flywheel when hot and ruin driven plate facings. Make sure that surface of flywheel is clean and dry. Make sure that splines in driven plate hub are clean and apply a light coating of Lubriplate. Driven plate facings must be clean and dry. Place driven plate on pressure plate with oil slinger toward pressure plate, then place 1958 Buick clutch assembly in position against flywheel, being sure to align marks made on flywheel and cover before removal. Install cover bolts with lockwashers but do not tighten bolts. Insert a spare main drive gear through hub of driven plate and into the pilot bearing. Tighten each clutch cover bolt one or two turns at a time to draw cover down evenly and avoid distortion of cover. While tightening cover bolts, move main drive gear from side to side to center driven plate with pilot bushing. If plate is not properly centered it will be difficult to slide transmission into place. Make sure all cover bolts are uniformly tightened. Remove spacers from between cover and release levers. Fill groove in release bearing sleeve with wheel bearing lubricant. Coat release yoke ball stud and ball recess in release yoke with Lubriplate or Delco Brake Lubricant. Attach release bearing to release yoke and attach yoke to ball stud in flywheel housing. Install release bearing support with a new gasket, placing support in flywheel housing with the tab on support alined with molded recess in housing to permit positive drain back of oil to transmission. Install spring washer with outer edge against bearing support. Install transmission (par. 4-13), being careful to avoid damage to 1958 Buick clutch driven plate which would result if weight of transmission is allowed to rest on main drive gear in driven plate hub. Install boot and release rod nut lock on yoke (fig. 4-5), attach release rod to yoke, then adjust for 1958 Buick clutch pedal lash of 1 1/8″ to 1 1/4″ (par. 4-4). Install flywheel lower housing, making sure that gasket is in condition to insure a tight seal. Install rear axle assembly (par. 6-4). Road test car for clutch performance. Under no circumstance should the 1958 Buick clutch be harshly used immediately after installation of a new driven plate, flywheel, or pressure plate. Sudden engagement of clutch with engine running at abnormal speed, or continual slipping of clutch, may permanently injure driven plate facings and may cause scoring of flywheel and pressure plate. When these parts are new they must be given moderate use for several days until nicely burnished. Be sure that car owner is advised of this requirement. Wash all metal parts of 1958 Buick clutch, except release bearing and driven plate, in suitable cleaning solution to remove dirt and grease. Soaking release bearing in cleaning solution would permit solution to seep into bearing and destroy the lubricant. Soaking driven plate in cleaning solution would damage the facings. Flywheel and Pressure Plate. Examine friction surfaces of flywheel and pressure plate for scoring or roughness. Slight roughness may be smoothed with fine emery cloth, but if surface is deeply scored or grooved the part should be placed. Clutch Cover. Inspect 1958 Buick clutch cover for cracks or distortion. Check clearance between pressure plate driving lugs and edges of slots in cover, using feeler gauges. The clearance should be .005″ to .008″; excessive clearance may cause rattle when engine is intermittently accelerated with 1958 Buick clutch disengaged. Clutch Driven Plate. Inspect driven plate for condition of facings, loose rivets, broken or very loose torsional springs, and flattened cushion springs. See figure 4-2. If facings are worn down near rivets or are oily, the plate assembly should be replaced. A very slight amount of oil on clutch facings will cause clutch grab and chatter. A large amount of oil on facings will cause slippage or drag. Removal of oil by solvents or by buffing is not practical since oil will continue to bleed from facing material when hot. When oil is found on driven plate facings, examine transmission drainback hole, pilot bushing, engine rear main bearing and other points of oil leakage. Test the fit of driven plate hub on transmission main drive gear; an easy sliding fit should exist. Regardless of whether the old plate or a new one is to be installed, the plate should be checked for run-out. This check can be made by sliding the driven plate, front side first, over the transmission main drive gear until it is tight on the spline, then setting up a dial indicator bear against the plate facing as shown in figure 4-7. While holding firmly against front end of main drive gear to take up play in main drive gear bearing, slowly rotate driven plate and observe the amount of run-out shown by indicator. If run-out of front facing exceeds .025″ the plate should not be used since it is not practical to correct excessive run-out by bending. Inspect 1958 Buick clutch release bearing for scoring or excessive wear on front contact face. Test for roughness of balls and races by pressing and turning front race slowly. Inspect main drive gear pilot bushing in crankshaft. If bushing is rough or worn it should be replaced, using Puller J-4383 for removal.